Boil the milk with half the chamomile tea bags in a small saucepan. Bring the coconut milk to a boil with the remaining chamomile tea bags in a second saucepan. Remove both from the heat and set aside, swirling the tea bags occasionally, and let the milks cool. Finely chop the loose chamomile tea. Then soak chopped tea in a bowl of hot water. Remove the tea bags from the coconut milk and stir in the starch. Return the mixture to the stove and whisk continually over low-medium heat until thick in texture. Transfer the coconut-chamomile mixture to a bowl, cover with plastic wrap, and place in the refrigerator. Preheat the oven to 175°C/350°F. Grease and flour a baking tin. In a large bowl, using a hand mixer beat most of the butter with most of the confectioner's sugar, half of the vanilla extract, and salt until fluffy. Beat in the eggs one by one. In a separate bowl, mix the flour with the baking powder. Gradually fold in part of the flour mix and the chamomile-infused milk to the butter mixture. Drain the soaked loose chamomile tea and add the leaves to the batter. Mix to combine. Spread the batter into the greased baking tin and flatten the top. Bake at 175°C/350°F for approx. 20 min. or until golden brown on top and the sides start to pull away from the tin. Remove the cake from the oven and immediately brush the top with a thin layer of apricot jam, then set aside and let cool completely for approx. 60 min. Meanwhile, to make the frosting, beat together the remaining butter in a large bowl with remaining vanilla extract and remaining confectioner's sugar. Stir in the cold coconut-chamomile mixture and honey. Beat gently on low speed until smooth. 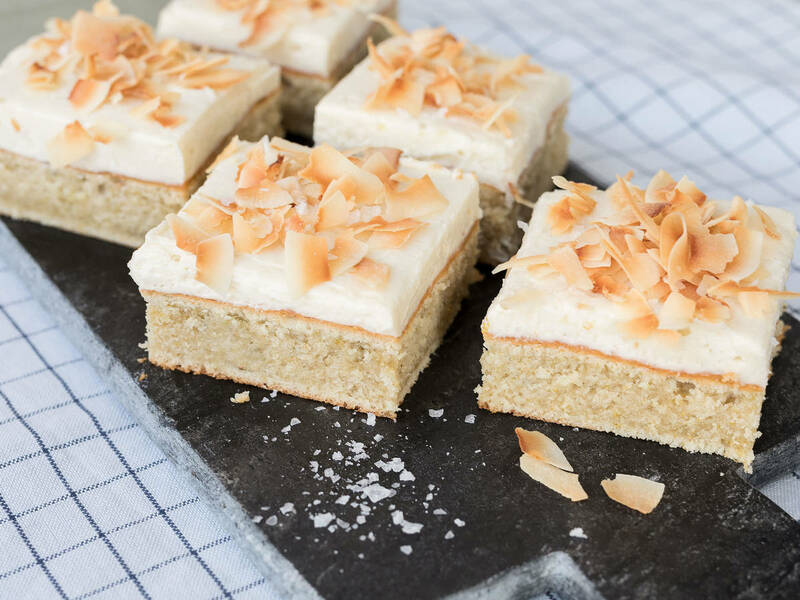 Spread over the cooled cake and decorate with fleur de sel and toasted coconut flakes. Slice and enjoy!